Turkish President Tayyip Erdogan said Turkey will stand its ground after U.S. President Donald Trump threatened to slap sanctions on Ankara if it does not free anAmerican pastor, broadcaster Haberturk reported on Sunday. The friendship between the United States and Turkey is on the line in this dispute, Erdogan was quoted by TRT Haber and other media. [post_ads]"We will not take a step back when faced with sanctions," Erdogan is quoted as saying. "They should not forget that they will lose a sincere partner." 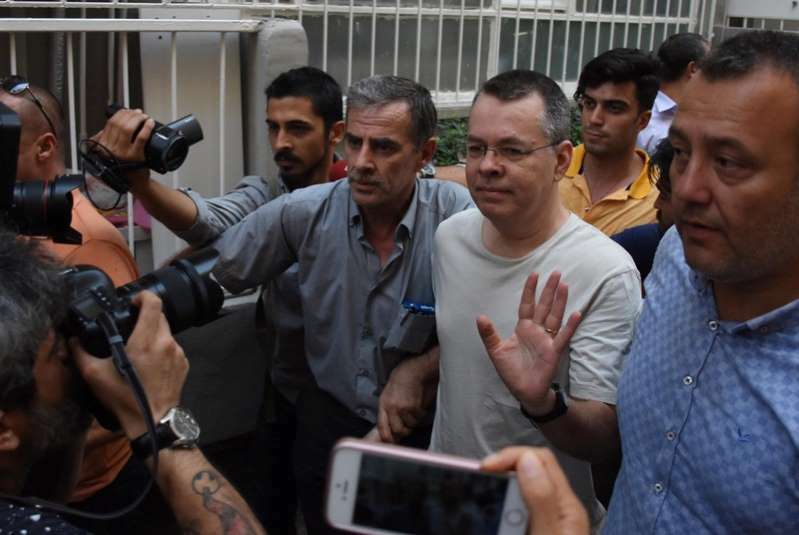 American pastor Andrew Brunson, who was transferred to house arrest this week after 21 months of detention in a Turkish prison, has worked in Turkey for more than two decades. Brunson has been accused of supporting the group Ankara says was behind a failed military coup in 2016 and Kurdistan Workers' Party (PKK). The pastor, who has denied the charges, faces up to 35 years in jail if found guilty. Diplomats have been working to settle the tense dispute and on Saturday U.S. Secretary of State Michael Pompeo discussed the status of the pastor with Turkey's Foreign Minister Mevlut Cavusoglu, the State Department said.